Illustrated with tables and figures in color. Includes index. While numerous technical developments are proceeding in the field of radiation therapy, image-guided radiation therapy and the Monte Carlo method have recently attracted much attention. 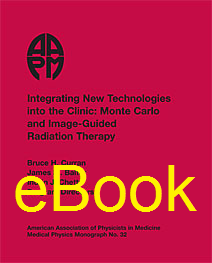 These two topics, covered in this book from sessions presented at the 2006 AAPM Summer School, present significant changes in the influence of technology on the practice of radiation oncology. This text will serve as a valuable reference for physicists who seek to further integrate Monte Carlo and image-guidance techniques into clinical practice.